Original cover by Ross Andru and Mike Esposito; DC 1968. Aaron Conley's website is here. A guy with a big round bright orange head was walking down the street with his girlfriend, and ran into a friend he hadn’t seen in years. You know, that original cover is so bizarre that I don't think any rendition of it could ever do it justice. With a big, giant, round head. I'll have what Ross was smoking. I like the simple color choices which Aaron made...feels "hot". I love that in the original they went with the giant close-up instead of showing the Flash running. He looks like he could be straight off of an early EIGHTBALL cover. I agree with Richard J. Marcel, that original cover is far too awesome for any straight reinterpretation to add anything to it. Well, I like Conley's version for the new intense determination on The Flash's face, it cracks me up. 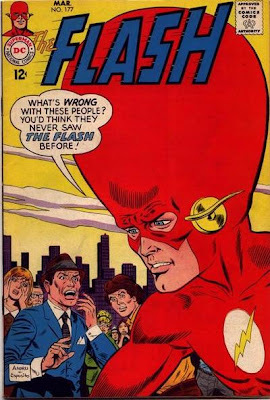 Apparently big head Flash is a time-honored tradition. Here's a couple of other wacky examples. brilliant. 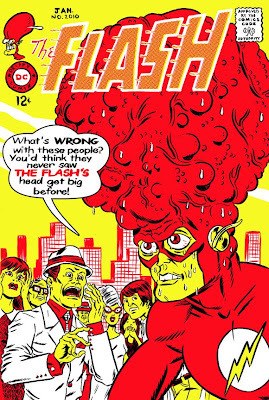 I love flash's veiny head. it's so gross! i also like how the issue number at the top was changed for the date. The sweat really makes this one. LOVE IT.